Heating, ventilation and air conditioning (HVAC) control panels are systems that manage the temperature and air in a given environment. They are suitable for commercial, residential, public or industrial usage. Sarum Electronics, UK specialist HVAC control panel manufacturer, has been supplying quality manufactured HVAC controls for over three decades and our extensive knowledge and experience with HVAC systems is one of the primary reasons why clients choose our services. 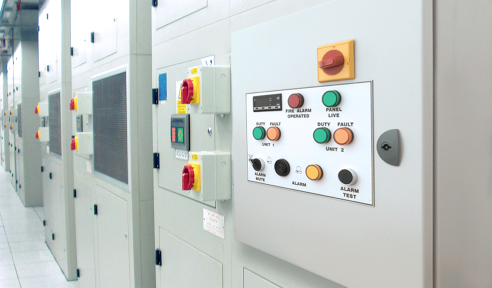 Read more about our Bespoke HVAC control panels here. Read more about Standard controllers here. All our solutions are designed to work with either existing or newly installed equipment and can oversee single or multiple environmental HVAC control systems. Both types of service are carried out under the professional supervision of our highly experienced and friendly technicians. Quality is paramount for us and can be seen in our products, services and aftersales care. Rigorous testing and a robust quality procedure helps ensure that all our products work perfectly from day one. Our attention to detail makes us confident in providing a 12 month guarantee giving you peace of mind that our products will always perform as you expect. Read more about our hvac control product support here.